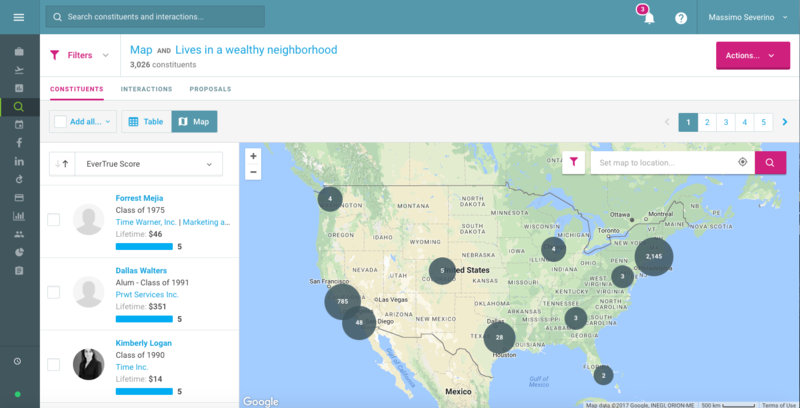 Create a search in EverTrue for “ Lives in a Wealthy Neighborhood?” The default option searches for constituents in a neighborhood where the average home value is $1 million or more, but you can add other filters to adjust the search parameters. Here's the map view of constituents living in a wealthy neighborhood. You can choose to view the results in a table, as well. This search is a great starting point, and you can add additional filters to narrow your results. Check to see who among your search results also has a high EverTrue score, indicating a likely donor. Look for alumni and parents who have recently engaged with your school on Facebook. Look at gift history, which is the best indicator of future giving. Use LinkedIn to find people at the founder, president, VP, or C-level to help generate a list of the right prospects. Once you have your list, dive into each constituent’s profile and share likely candidates with your gift officers or alumni relations staff. Results: Help gift officers book more meetings and engage with the right constituents.